If you would like to hear me blather on at MIX about how to create Silverlight applications, feel free to go visit the MIX site and vote for my sessions. I submitted seven talks so feel free to pick your favorites. 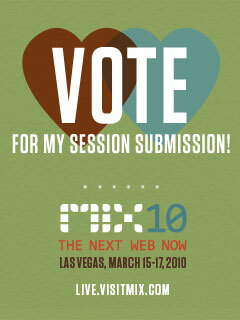 You'll have the opportunity to vote for five of your favorite sessions. Remember, even if you don't think you can go, these are the sessions that will be recorded and available after MIX...so everyone gets a chance to vote!